Soon you may be able to toss your hand sanitizer. Two teens from Hong Kong have created a new door handle that wipes out 99.8 percent of all germs on contact, potentially revolutionizing the hygiene industry. Realizing the extent to which bacteria spreads on public door handles, shopping carts and other objects touched by hundreds if not thousands of people each day, 17-year-old Sun Ming (Simon) Wong and 18-year-old King Pong (Michael) Li sought a material that could eliminate bacteria. Turns out titanium oxide does the trick, but they had to come up with an innovative way to activate it. Simon and Michael discovered that titanium oxide is an efficient bacteria-killing machine. So they ground the titanium oxide into a fine powder and dusted a door handle with it. But this device is more effective when exposed to ultraviolet (UV) light. 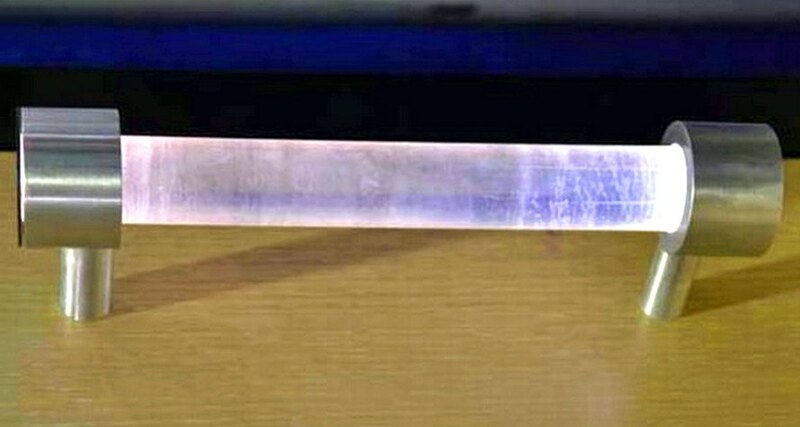 Since most of the objects that spread germs are indoors, they needed to devise a way to expose the titanium oxide to UV indoors, so they embedded an LED light into one of the brackets holding the door handle. The LED is powered by a gearbox in the door that harvests the kinetic energy of the door’s motion and converts it into an electrical charge. When a person grabs hold of the handle, the UV light switches on, activates the titanium oxide and instantly zaps 99.8 percent of the germs that might otherwise have been spread. And all of this comes in a $13 package, which means it’s affordable to replicate en masse. Students at the Tam Lee Lai Fun Memorial Secondary School, in Tuen Mun, China, these young men are destined for bigger things. 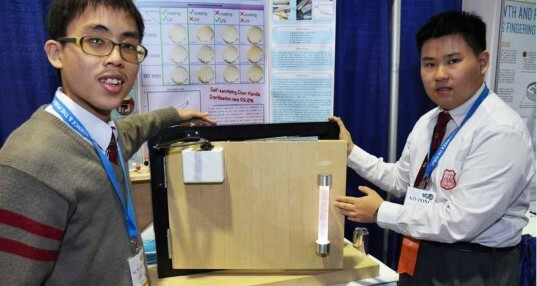 They recently showcased their brilliant invention at the Intel International Science and Engineering Fair to an enthusiastic audience, and there’s no way we’ve seen the last of them. My question about stuff like this is if you set up lights in a house and douse the inside with UV light would it kills the germs or just light up the house? Same concept already under patent US#20100140499, US7175807 and China patent #CN202152563U, CN2128299Y. So...what is new?